This article shows you a step by step breakdown on exporting reports to Excel. 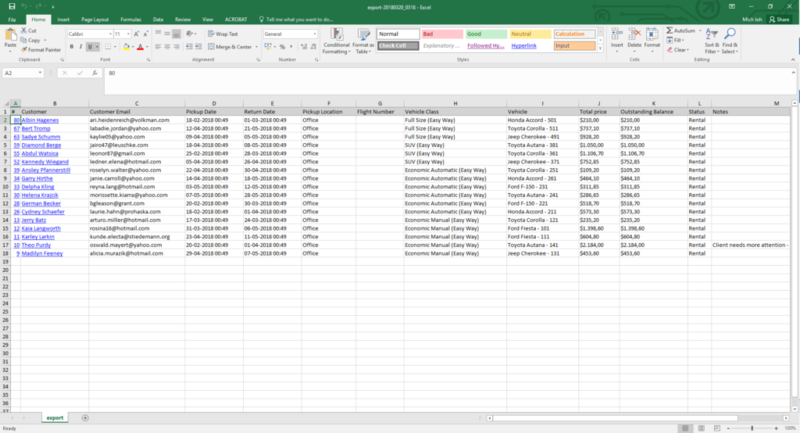 You can essentially export all tables from the system to an Excel sheet. In this example, we will be using the reservations page. Firstly, navigate to the page you would like to export data. In this case, it would be the reservations page located under the Car Rental category, highlighted in dark blue in the picture below. Apply the filter for the report that you would like. For example, you want a report only about the reservations that are currently on rental, therefore you can apply the “Rental” filter. To learn how to create a filter, follow this link here. In the picture below, you will notice that reservations are only those whose status is “Rental”. Next, add or remove additional columns that you would like for reporting. You can learn how to do so by following this link here. In the picture below, we added the “Outstanding Balance” column. Do note that you will have to select the columns first so that the exported data will contain it as well. Lastly, export the table values you have created. You can learn how to do so by following this link here. Once the system is done exporting reports to Excel, you will get an excel sheet like below.